Soul Yoga studio hosted a charity event Feb. 18 to raise money for RISE, an organization that provides crisis intervention for sexual assault survivors. The event was a yoga marathon consisting of 45-minute classes that ran from 9 a.m. to 3 p.m. at the studio, located off California Boulevard and Taft Street. The classes were free but donations were accepted and 100 percent of the proceeds went to the organization. Soul Yoga owners Laura and Jason Rogers opened the studio with the goal of giving back to the community. They are both liaisons for their daughter’s organization, the Morgan Family Foundation, a dedicated donor to RISE that matched the monetary donations made at the event. Jason said because they had a family member use the services offered by RISE, the couple has a more personal affiliation with the organization. “It’s just something that was close to our hearts … Especially in this very current culture and time right now, with things like the #MeToo movement and all of that, it’s very important,” Jason said. The Rogers have dreamt of opening Soul Yoga studio for years. The studio opened its doors in January and is open to all skill levels. 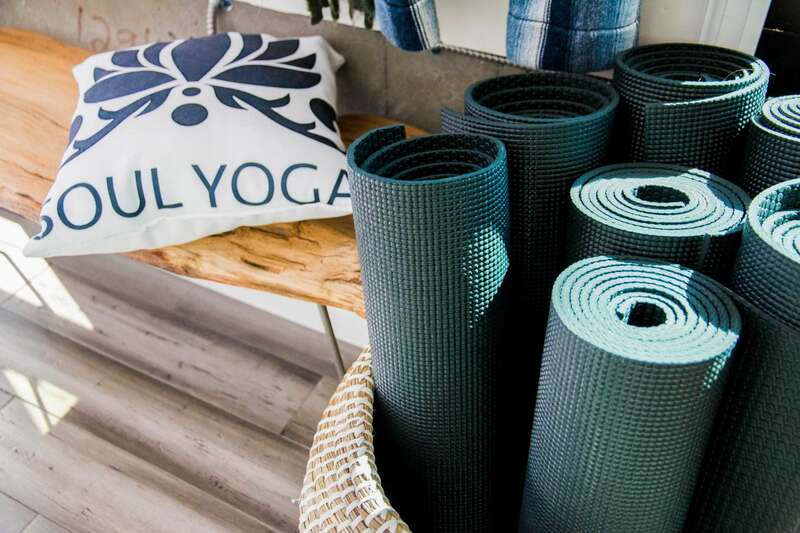 “We both have a real passion for service and one of our main reasons for opening the studio was to have a place where people could come and feel nourished and safe and centered and get traditional yoga … So I think our intention was to just create a space where people can come and teachers can teach in a passionate way,” Laura said. Jason added that there were many factors that went into how and where they wanted to create the space for Soul Yoga. “We wanted to make sure we were close to Cal Poly so there’s that demographic of students who will be able to reach this place easily, but then we also go across all the demographics, all ages, all social groups — everybody is welcome to try and find a little bit more about themselves on the mat here,” he said. Kinesiology sophomore Lyrica Blume lives near Soul Yoga and said she wanted to become involved shortly after it opened. She received her yoga teaching training certification last summer and now substitutes classes and works at the studio’s front desk. Like Blume, Laura said her journey with yoga began when she met her mat. “You’re always going to get the physical, when you go to class you’re always going to get the physical, but it’s that internal and emotional movement into a different level of who you are. That’s the power of yoga,” Laura said. Soul Yoga studio lives by the motto “cultivate, manifest, unite” and hopes to make an impact on the community of San Luis Obispo and beyond. “We feel super blessed to be in this community and super supported and we just want to give back. We have a firm belief in that you can’t keep what you have unless you give it away, so it’s always about this moving outward,” Laura said.